If you purchase a Thousand Trails Camping Pass through our website or call center and are not satisfied with your Thousand Trails Camping Pass for any reason during the first 30 days after you sign the purchase agreement, or after you stay at a campground for not more than two consecutive nights, whichever comes first, you may cancel your purchase agreement and receive a refund of your annual fee and (if applicable) enrollment fee. You must cancel your Thousand Trails Camping Pass by sending a written notice of cancellation to MHC Thousand Trails Limited Partnership, Attention: Contract Processing, 6500 Pinecrest Drive, Suite 300, Plano, Texas 75024. 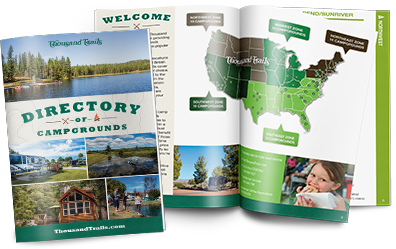 The notice must be postmarked by midnight of the 30th day after the day on which you signed your Thousand Trails Camping Pass purchase agreement or before you stay at a campground for more than two consecutive nights, whichever occurs first. Mailing by ordinary mail is adequate but certified mail return receipt requested is recommended. This guarantee does not apply to an upgrade after your initial purchase. Give the Gift of a Camping Pass!